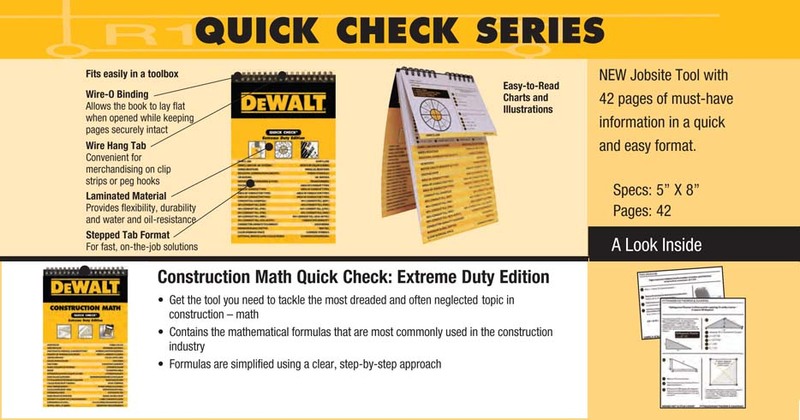 DEWALT Construction Math Quick Check: Extreme Duty Edition has identified the mathematical formulas that are most commonly used in the construction industry and simplified them using a clear, step-by-step approach. Topics include basic conversions, percentages, volume calculations, framing calculations, and more. The guide also offers more than just solid content: its durable material makes it a toolbox- and site-friendly resource, and its tabs make it easy to quickly access the information you need, when you need it. Chris Prince has been in the construction industry for the past 15 years, both in the field and formal training. By developing courses and teaching in live classroom settings, he has helped more than 10,000 candidates across the country prepare for state licensing exams. Mr. Prince has been instrumental in launching an online training program for residential and commercial contractors, with emphasis on building theory, codes, licensing, lien laws, business management, ethics, OSHA, contract law, payroll, and project management. He is a graduate of Middle Tennessee State University.